A century ago, libraries, museums and research institutes worldwide suddenly acquired large numbers of manuscripts, paintings, textiles and artefacts from archaeological excavations on the Eastern Silk Road. The finds were unprecedented and there was little expertise worldwide on how to care for or to conserve the often fragmentary material. Two World Wars impeded communication among conservators, curators and scholars and, albeit with best intentions, existing institutional practices were often applied inappropriately to the materials. Chinese and Japanese collectors lined some manuscripts as if they were painting scrolls, while European conservators bound Tibetan pothi as if they were pages of a Western codex (see The Conservation of the Stein Tibetan Manuscripts). During the 1970s and 1980s communication increased and conservation practices began to change. Conservators started to consider traditional and less invasive methods and to visit conservation studios elsewhere to learn from colleagues. This culminated in an international conference in October 2003 which marked the start of IDP (see IDP News 1). Conservation has remained an integral part of IDP’s work. One manifestation of this is the conservation conference, hosted by IDP members worldwide since the inaugural one in 1993, but now returning to the UK for the Seventh IDP Conservation Conference (see Recent IDP Conservation Initiatives). 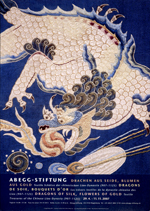 The papers from the Sixth Conference (held in Beijing in 2005) are being published in May 2007 to coincide with this in a bilingual edition (see Turfan Conservation in Berlin). During the past decade, IDP has raised funds for conservators, sponsored internships and conference visits, and initiated several collaborative conservation projects (see Recent IDP Conservation Initiatives). The papers from the Sixth Conference show that there remains a long way to go. Conservation practices still differ widely, especially in smaller institutions, and training opportunities remain limited. There are still too few fora for sharing information. Culture, language and institutional inertia often impede genuine exchanges. Scientific knowledge among conservators worldwide remains patchy and scientific advances are often not disseminated. However, although most institutions remain overwhelmed and underfunded, there is now a much better understanding of the material. The vast majority of it is in secure storage with environmental controls and there is now little interventionist conservation. With the launch of its conservation website (Recent IDP Conservation Initiatives), including a bilingual glossary, IDP hopes to encourage further dialogue and understanding of the materials. Stein's 1907 photograph of Tibetan pothi from the Dunhuang Library Cave. The Tibetan manuscripts which were brought to Britain following Aurel Stein’s second and third expeditions were all deposited in the archives of the British government’s India Office in the early decades of the 20th century. 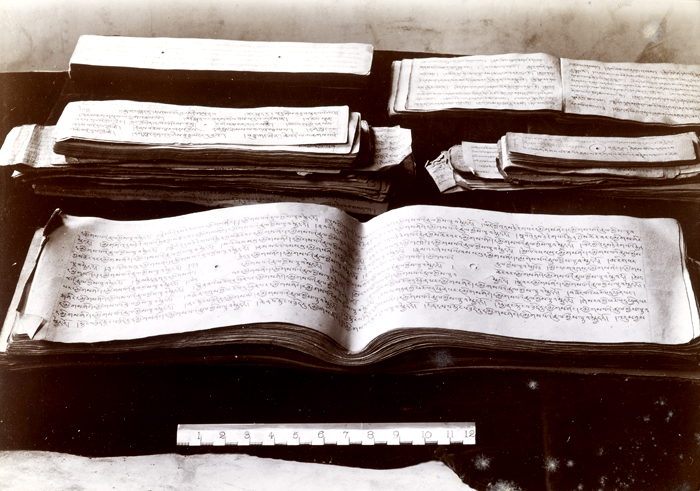 Many of the Tibetan manuscripts were in loose-leaf pothi format. When found in the Dunhuang library cave these leaves were bound in bundles along with manuscripts in other languages, including Sanskrit, Khotanese and Uighur. At the India Office Library the different language groups were separated and placed in different shelfmark classes — in the case of Tibetan, IOL Tib. This group also included several hundreds of Tibetan scrolls, mostly copies of a single sutra, the Aparimitāyurnāmasūtra. The loose Tibetan pages were sorted and catalogued by the Belgian exile Louis de la Vallée Poussin and the India Office librarian F. W. Thomas. The conservators at the India Office Library employed the standard methods of conservation to preserve damaged and fragile manuscripts, backing with paper and covering with silk gauze. In addition, the loose-leaf pothi manuscripts were bound into leather-covered volumes (1). Although these conservation methods were appropriate for their time they are now not considered best practice. Since the 1990s the British Library, which inherited the India Office Library collections, has been reversing much of the previous conservation. The loose leaves have been removed from the leather-bound volumes and the old paper backing and gauze is gradually being removed from all of the pages, replaced where necessary with minimal repairs of torn and fragile pages. As a result, the manuscripts are now much closer to their original form (2). Sam van Schaik is Research Project Manager for IDP working primarily on the Tibetan Buddhist manuscripts. These pictures illustrate how a Tibetan manuscript was conserved using western techniques with a typical simple western binding style and how another manuscript was conserved by reversing previous treatments. 1. 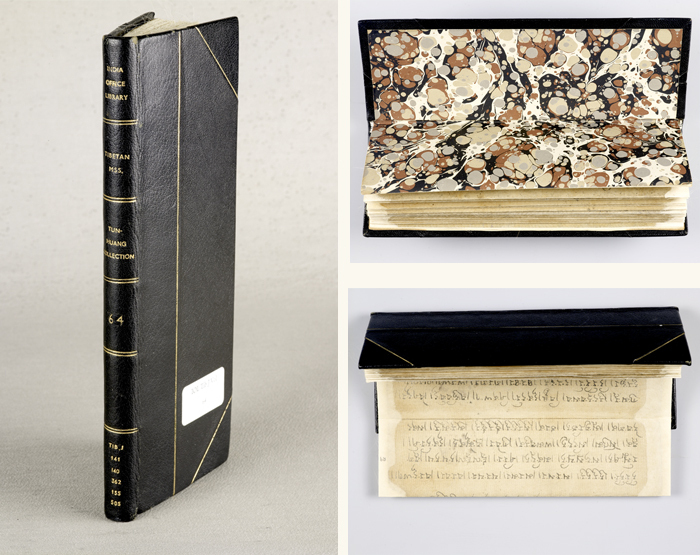 Tibetan pothi bound as a Western codex, showing the marbled paper in western style and the paper repairs made to support the fragile and damaged edges of the original. In the first, (1) the cover was bound in full leather with no French grooves and false bends on the spine and with marbled end papers. The manuscript folios were repaired using Japanese papers of a natural tone with no attempt at colour matching. Each folio was given a false margin all around the edges to obtain a consistent size to fit within the binding. The repairs were done by overlapping the edges of the paper by an average of 2 mm. It is very likely that wheat starch paste was used to adhere the repairs, making their removal for future conservation less problematic. Each set of folded folios was lined on both recto and verso using silk gauze. This procedure, standard practice in many institutions at the time, caused the folios to become stiff with the addition of a large amount of adhesive. In addition, the paper became brittle as silk is acidic by nature and was acts as a catalyst to increase the acidity levels in the paper. In reversing such a treatment it is important to consider that excessive addition of moisture to remove the lining, might cause that paper which has been dyed to lose its colour. 2. A Tibetan pothi restored to its original format, stored in an acid-free conservation material. Unbleached calico is used to wrap the manuscript. After conservation, the second manuscript has been given a custom-made box fully lined with acid-free archival paper. An additional layer of acid-free unbleached calico has been used as a wrapping together with conservation boards placed at the top and bottom of the manuscript (2). Barbara Borghese is UK and European Project Coordinator for IDP. She previously worked with IDP as a conservator. One of the endeavours of IDP is to endorse the study of Central Asian collections through encouraging, sponsoring and promoting active research in many different fields. Thanks to advances in modern technology, scientific examination of culturally significant material is today possible with minimum handling, thus reducing the risk of damage to the objects. With modern investigative techniques we are able to analyse objects without the need to collect large samples; in fact we now have techniques available which allow us to proceed with in situ analysis without the need for destructive sampling. The use of infra-red technology, for example, allows us to search for hidden content without having physically to disturb the objects (see IDP's infrared pages). A better interaction and understanding between scientists and conservators have been instrumental in facilitating the development of more material-friendly techniques for research. This year as part of its Leverhulme-funded research project on the Palaeography and Codicology of Dunhuang Manuscripts, IDP has initiated two projects focusing on the study of paper fibres, paper technology and manuscript chronology. Brief details are given below and full reports will be published on the IDP website. Over the past century, several analyses have been carried out on the codicology of the dated manuscripts from Dunhuang, including fibre analysis, measurement of laid and chain lines, and panel size. Some of these data are contradictory: so, for example, in separate studies by Clapperton and by Collings and Milner, different conclusions were reached on fibre identification. IDP is bringing these data together on the IDP database, and also commissioning new studies in order to compile complete and accurate data on a large group of manuscripts. These can then be used by all as a reference set for detailed codicological and palaeographical analysis. As part of this programme, Anna-Grethe Rischel, former Head of the Paper, Textile and Leather Section and Member of the Conservation Board at the Danish National Museum, visited the British Library to work on the manuscripts formerly studied by Clapperton et. al. She will present her preliminary fundings at the Seventh IDP Conservation Conference and they will also be added to the IDP database. Anne-Grethe Rischel has spent many years on the macro- and microscopic study of papers from across the Silk Road. She has presented her results at all previous IDP Conservation Conferences and her research has shown the importance of the collation of micro- and macroscopic data on a large number of manuscripts in order to understand genuine similarities and differences. Microscopic images of fibres from Tibetan manuscripts taken by Agnieszka Helman-Wazny. From IOL Tib J Vol 69, ff. 33,51,16. 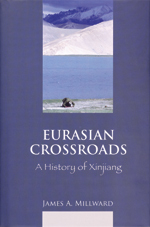 ‘The character of Tibetan books is unique, and is closely related to Tibetan Buddhist culture and the history of the book in Inner Asia. In this study, the technical aspects of book making have been tracked historically. Different types of Tibetan bookbinding were sought and chosen for the study from the collections of the British Library in London, the Library of Tibetan Works and Archives in Dharamsala, the Tibetan Museum in Lhasa, and the Asia and Pacific Museum in Warsaw. Unfortunately, this study could not cover the complete span of book history because many of the books studied were undated. Objects described below mainly date from the 8th–12th and the 17th centuries, and come from different regions. The pothi style of book, consisting of loose leaves in cloth covers with wooden boards, is the most representative of Tibetan books, independently of time period, but many other forms and binding styles exist. The scrolls, concertina, and many other styles of sewn bindings in different formats and on different materials were identified and described. Books and documents exist on many types of paper, as well as on birch bark, silk, wooden slips, metal tablets and combinations of materials. Different methods of binding were studied from both historical and artistic viewpoints. Differences in mounting, sewing and the function of books were emphasized and will be presented as examples during the conference. The possible origin of binding techniques and terminology for them is also discussed. In many cases the form of the book seems to be influenced by its region of origin, but the materials used for the book are related to its nature or function, to the donor who hoped to gain spiritual merit from creating it, and to the availability of materials. Tibet in the past was a huge region and Tibetan script was used elsewhere in Inner Asian for religious purposes. Professor Takeuchi argues that it was a lingua franca of Silk Road communication. This is probably the reason we see so many different styles of Tibetan bookbinding. Tibet was on the Silk Road, and so was privy to its cultural, technical and artistic exchanges. Indian, Chinese and other influences on Tibetan bookbinding styles also raise the question of the connection between the history of the book in Tibet and that in Inner Asia. The need to communicate effectively using a common language has long been recognised among the conservation community. In 2006, prompted by the forthcoming publication of a bilingual (English/Chinese) conservation publication (see Publications), work started on the creation of a conservation glossary to be translated into the languages used by IDP to facilitate and promote the effective sharing of knowledge and information. One of the main problems when communicating in technical terms among international users is that a literal translation does not provide an understanding of the context and the derivation of the terms. This is especially true in disciplines such as conservation where some terminology can have a very remote and obscure origin and cannot be translated into any other languages without the help of a bilingual expert in the field. The glossary is intended as a tool which will be incorporated in the section of the IDP website devoted to conservation (see below). The conservation glossary will be a dynamic reference instrument to which users will be able to contribute by adding content. IDP aims at making the glossary available in all the languages of its growing community of users. So far the glossary includes 150 terms and it is available in English and Chinese. This glossary does not pretend to be exhaustive; we hope there are sufficient terms to get started and allow very broad and basic principles to be described and understood. Further development will, of course, be required in order for it to become a comprehensive tool of use to the broader conservation community. IDP is adding more conservation-related content to its website by creating the 'Conservation Hub': a series of pages entirely devoted to conservation and restoration of Asian materials. These pages will be designed to be of use for both professionals in the field and also people with a general interest in conservation topics. As a tool for professionals, the pages will include useful links to other conservation resources, a multilingual conservation glossary, conservation case studies, treatment videos and a searchable archive containing conservation papers. The section on projects will focus on past and ongoing projects but will also act as a 'hub' where people and institutions can meet, promote and facilitate the creation of new projects. The conservation pages will also include a section on education with, among other things a series of printable 'fact sheets' to be used as teaching resources or simply as reference material. The site is currently under development and will be announced on the home page of IDP. The biannual IDP Conservation Conference takes place at the British Library from May 21–23, 2007, the seventh in the series. Conservators, scientists and specialists in the field of Central Asian studies will have the rare opportunity of meeting to share their knowledge and expertise in an international context. The conference coincides with the opening of the British Library new Centre for Conservation so that the event will be partly hosted in the new premises housing the conservation studios and the sound archive. As part of the IDP commitment to education and training, the conference will include two practical workshops taught by highly respected professionals in the field of conservation and science. The first workshop, titled 'Exploring Traditional Oriental Binding Structures', will investigate binding structures represented in the British Library collections. Participants will be introduced to different binding styles and will be given the opportunity to prepare a mock up structure using originals as models. The second workshop, entitled 'Microscopic Examination of Asian Fibres', will introduce participants to the use of optical microscopy to perform fibre analysis. Participants will learn how to make sample slides, set up a microscope and recognise some basic characteristics of commonly encountered fibres in Asian papermaking. The papers, case studies and results of the conference will be published by IDP on its conservation pages. Top: A box of Manichaean fragments, M6611, brought back by the German Turfan expeditions, before restoration. Bottom: Fragment Ch 1792 after restoration. The following is an extract from the paper presented by Dr Simone-Christiane Raschmann to the Sixth IDP Conservation Conference. It is published in Tradition and Innovation (details below), copies of which can be ordered directly from IDP. For more than a hundred years — since the return of the German Turfan expeditions — a little box containing several hundred very small Manichaean fragments has been preserved in the collection. Since scholarly interest in Manichaean studies has increased considerably in the course of the last ten to fifteen years, the search for new source material has also intensified. Thus, one of my colleagues, Desmond Durkin-Meisterernst, became interested in these small Manichean fragments (M 6611) (below left). We decided to spend some money to have this box opened in order to gain access to these fragments, and find out if their conservation would be possible and advisable. We found a specialist in paper restoration, Dirk Schönbohm, who spent a lot of time finding an adequate method of conservation. After opening the box he realized that it mostly contained bundles of fragments stuck together. The individual fragments were extremely brittle. It was thus clear that a mechanical separation of these bundles using traditional tools would be impossible as the fragments would break apart. Stabilising the separated fragments using a lining of Gossamer tissue and methyl cellulose would have reduced the legibility of the text on the fragments. Neither would a simple resizing of the individual fragments yield the desired stability. After consulting with the restoration department of the Berlin State Library, the specialist decided upon a suitable method to conserve the fragments, described in my paper. One hundred and fourteen Manichaean fragments were separated in the course of this first stage of conservation. Several hundred pieces are still in this box. It remains to be seen however whether the recovery of all these fragments will increase our knowledge of Manichaeanism in Central Asia, especially in the Turfan oasis. 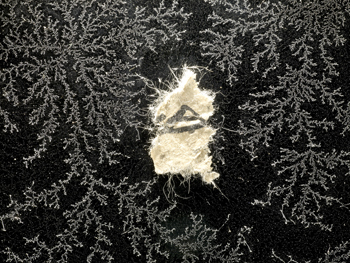 The fact that these small fragments are stuck together arouses particular interest in itself. It seems that the bundles are parts of books and that they preserve the fragments, however small, in the original page order. Since most of the Iranian fragments in the Turfan collection are individual pages torn from the books to which they belonged, and later scattered on the ground, the possibility of having even small fragments preserving the order of the pages in a book is exciting for philologists. 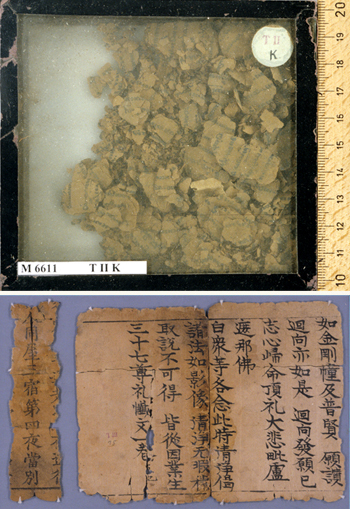 If the text on these fragments can be connected to other texts known from other fragments, the sequence of the fragments in the small box will help to establish the sequence of the larger but otherwise isolated fragments. For this reason alone it would be highly desirable for this conservation work to continue. 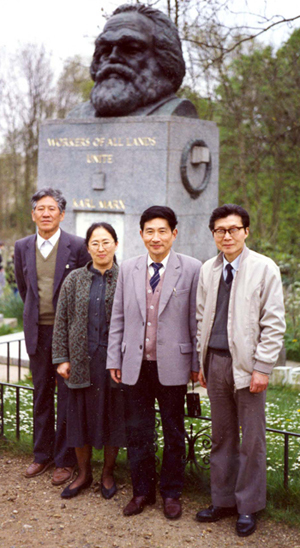 Wang Xu (on left) with Wang Yarong and colleagues from the Sichuan People's Publishing House at Marx's grave in London. Many of us who began studying Chinese in the early 1960s had a very romantic idea of the Chinese revolution. One notion we had was that people in the ‘New China’ would be especially selfless, hardworking, and dedicated to the common good. When China finally began to open up in the 1970s and travel to China became possible, it was in the last throes of the Cultural Revolution. Soon, however, Sino-British scholarly exchanges brought a remarkable cast of Chinese scholars to Britain, many of whom were brilliant, patriotic, extraordinarily hard-working, and, considering their recent past, remarkably optimistic. However, there was one who still managed to stand out because he personified that early ideal of New China: that was Wang Xu. By the time he came to Britain to carry out photography for the Dunhuang facsimile project in 1988, Wang Xu was an established scholar, a specialist in the history of costume and textiles, working in the Institute of History of the Chinese Academy of Social Sciences. He had had very little formal education. Born in 1930 in Laizhou (formerly Yexian) in Shandong Province, his father was a farmer and he only attended primary school. His grandfather taught him to read the Shiji (Grand Historian’s Records), but the rest of his education seems to have been acquired along the way, largely by reading at night. In 1946, at the age of sixteen, he joined the People’s Liberation Army (PLA). In the following year, he went to Shanghai, where he worked in a shipyard. There he began to paint, and it was this talent that provided him with his first opportunities. After Shanghai was liberated in 1949, he painted sets and played the violin with a PLA troupe. In 1952, Wang Xu was sent to take part in the Korean War, but, as he put it, under the conditions of battle, ‘set painters became unemployed,’ so he did whatever he was asked, from repairing instruments for the band, to acting as a purchasing official, and photographing sports events. Indeed, one of the most striking features about Wang Xu was that he seemed to be able to do anything. Later, when working as an archaeologist, he was often called upon to help when fragile materials had been excavated that required extreme delicacy of handling. Archaeologists who worked with him often mention his remarkable dexterity. But I believe he also had a mechanical genius, which enabled him to understand how things were put together. This enabled him to take them apart. It was also the key to his theory of conservation – in order to conserve something properly, he once explained to me, you cannot simply rely on modern science. You must understand how it was made in the first place. In 1953, Wang Xu met the novelist, Shen Congwen (1902–88), who noticed him drawing in the History Museum. By this time, Shen was working as an historian of costume. This meeting was a turning point in Wang’s life and, in 1958, with Shen’s encouragement, he entered the Institute of Archaeology of the Chinese Academy of Social Sciences (CASS). In 1978, he moved to the Institute of History, CASS, where he and Wang Yarong acted as assistants to Shen Congwen in compiling his monumental history of Chinese costume. In 1984 (the year when I first met him and Wang Yarong), he became Head of the Ancient Costume Research Section of the Institute of History. In the early eighties, I collaborated with Li Xueqin and Qi Wenxin of the Institute of History in publishing the oracle bone collections in Great Britain and China. One of the most important oracle bone collections was held by the British Library. Frances Wood’s immediate encouragement and assistance in making arrangements for Qi Wenxin to take rubbings in the Library were key to that project. A concomitant of it was the establishment of an annual exchange of scholars between the Far East Department at SOAS and the Institute of History, CASS, under the auspices of the British Council. When the oracle bone project was complete, the Institute of History sent two Dunhuang specialists to London — Song Jiayu and Zhang Gong. Song and Zhang soon broached the possibility of collaborating to publish the non-Buddhist manuscripts. Frances Wood and Beth McKillop were keen and they were able to persuade the authorities in the Library of the desirability of a project that would give Chinese scholars access to the manuscripts for the first time, but we had no funds. Thus, we got the idea of using the British Council exchange as a means of bringing a scholar capable of doing the photography to London. Li Xueqin (then Director of the Institute) suggested Wang Xu, who had considerable experience photographing archaeological excavations. By 1988, when Wang Xu came to London, Abraham Lue had become interested in the project and brought it to the attention of Elizabeth Frankland Moore of the Sino-British Fellowship Trust. With the help of Dr. Robert Frame, we obtained further assistance from the British Council, so Wang Yarong, with whom Wang Xu had been collaborating for many years, was able to accompany him and assist in the photography. 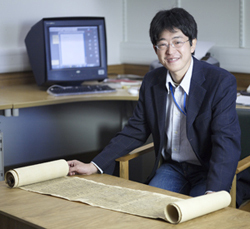 Prof. Ning Ke came to select the manuscripts to be photographed. Guan Yuanbo, Director of Sichuan Peoples Publishers, also agreed to publish the work. However, we were embarking on a very major project with great good will, but very meagre resources. Since Wang Xu, Wang Yarong, nor Ning Ke could speak English, we found them rooms in a student dormitory very close to SOAS and the British Library. This was common practice then — while the accommodation was not stellar, the location was central, the scholars had their own rooms, food was provided, and Chinese-speaking SOAS students could help with practical matters. Wang Xu and Wang Yarong quickly settled in to an intense work schedule. However, we had not accounted for their need to develop the film as they went along, so that they could check the quality of their photographs and re-photograph if necessary. Soon, they were not only photographing in the daytime, but developing film in the bathtub at the dormitory at night. We were all deeply touched, but they were determined to complete the work before returning to China, and good-humoured about it. The photography completed, Wang Xu and Wang Yarong returned to China in June 1989. In the following year, Wang Xu began to show signs of the kidney disease from which he died in 1997. He has left many legacies. Those in the field of textile conservation and the reconstruction of archaeological textiles and in the history of Chinese textiles and costume are well known. Another is the fourteen volumes that were eventually published by Sichuan Renmin Chubanshe as Yingcang Dunhuang Wenxian: Hanwen Fojing Yiwai Bufen. More broadly, the International Dunhuang Project itself may be taken as another of his legacies. On a personal level, it has been ten years since Wang Xu died and so many of us who knew him are left with a sense of profound loss. He was a truly great man. Sarah Allan taught at SOAS from 1972–95 and is now Burlington Northern Foundation Professor of Asian Studies at Dartmouth College in the USA. Yo-Yo Ma, Milo C. Beach et al. 96 p. 2 b/w + 75 colour illus. This is the catalogue of an exhibition held at the Art Institute of Chicago from September 2006 to April 2007 and features over forty intriguing objects—both ancient and modern—from the Art Institute’s collection. This is the first in the series A Complete Study of Textiles from Dunhuang, initiated and sponsored by Donghua University. The aim is to produce a systematic and comprehensive scientific study of all the known silk textiles from the Mogao Caves, Dunhuang. It is a multi-volume publication project, with each volume representing a different location. 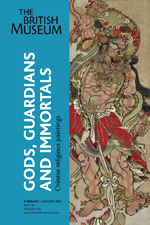 The first volume in the series covers Dunhuang textiles in the UK. This is a catalogue of more than 2000 photographs, letters, prints and maps relating to Stein in the Library of the Hungarian Academy of Sciences. Fully illustrated catalogued of the Tangut painting collection at the State Hermitage Museum by the curator. This part of the Dictionary of Manichaean Texts covers all extant Manichaean texts in Chinese from the Tang period and a large number of excerpts on Manichaeism and the Manichaean church from Chinese historical, institutional, literary and polemical sources. Definitions, explanatory comments, and cross-references are provided, as well as a lengthy English index. The interest of ninteenth-century European powers in the vast Iranian empires, whose territories extended eastwards through Afghanistan to the north-western borderlands of the Indian subcontinent, has been called ‘the Great Game’ and its effects are explored in this book. The Liao Dynasty was founded by nomadic Qidan tribes and ruled a vast empire in what is today northern China. The arts of stone carving, ceramics, goldsmith’s work and, above all, silk weaving and embroidery, were continued at an exceedingly high level. A group of textiles from Abegg-Stiftung’s collection, probably from the grave of a noblewoman, provides an insight into this world of luxury and beauty. In the heyday of the Silk Road, cities from China to Italy grew and flourished through textile technology and trade. China was first to discover the secret of silk and successfully guarded knowledge of its cultivation for many centuries. But as trade and travel along the Eurasian Silk Roads grew in the first centuries AD, so other civilisations gradually learned how to produce this coveted textile, often relying on migrants from China to pass on essential skills. Their cities and people became rich and silk was used in all areas of life, including money, books and clothing, although not without opposition from those who considered it decadent and immodest. This exhibition examines these themes using items mainly from the British Library’s Silk Road and Chinese collections. 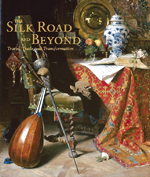 Susan Whitfield will give a lecture at John Rylands Library entitled ‘Myths and Legends of the Silk Road’ on Thursday, June 14, 2007 at 6.00pm. The 50th annual meeting of PIAC is organized under the sponsorship of the Academy of Sciences of the Republic of Tatarstan, the Cabinet of Ministers, the Ministry of Education, and the Town Council of Kazan. The meeting will be held on the premises of the Tatar State University of Humanities and Education, Kazan. At this stage, please do not now send the title of the paper you wish to give, and please do not ask for individual acknowledgements of your request. The centenary of Sir Aurel Stein’s first trip to Dunhuang is a fitting time to assess the importance of this important discovery in a specifically Hungarian context in Stein’s home town. 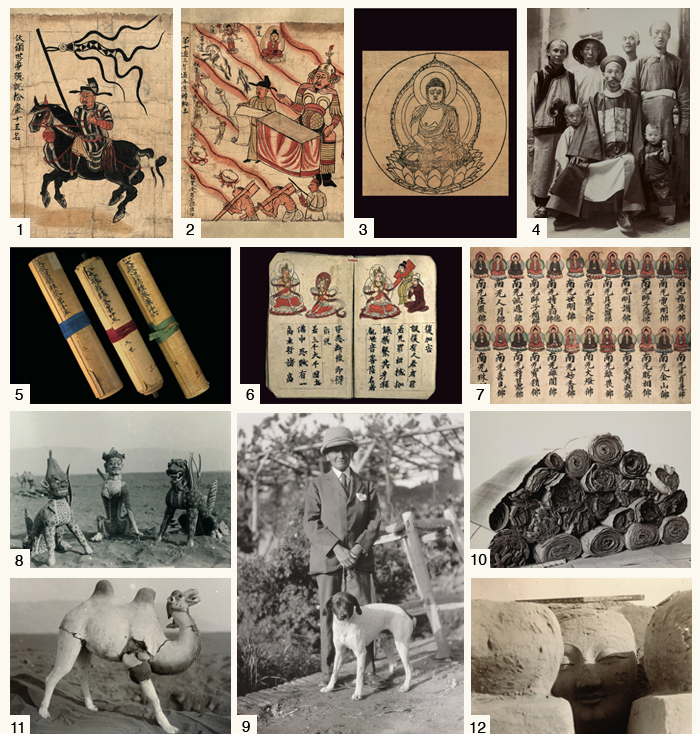 The workshop will also be an opportunity for scholarly exchange and discussions about on-going projects in art history, linguistic research, the study of Buddhism and ancient Chinese medicine — all based on textual and visual images from Dunhuang. Do you sometimes wish you had a an attractive postcard to hand for those quick thank you notes or a forgotten birthday or just a message that is more personal than an email? IDP can offer the perfect solution with a set of twelve beautiful cards. The postcards are 60 pence each but are available to IDP News readers at just £6 per set of twelve (inc. UK/EU p&p), a saving of 10 pence per card. Orders for more than twelve cards will be charged at £6 per additional set of twelve. If you prefer to make your own selection, twelve cards will cost £7 (inc. UK/EU p&p) and 60 pence per card thereafter (or £7 per additional twelve). Please send us the number of each card (use the numbers above) and the quantity of each one required with your order. NB: Remember to enclose your name and mailing address. ** For postcard orders from outside the UK/EU, please add £1 to your total for p&p. Orders from abroad are only available via the IDP secure online payment form (minumim £12). In 2005–7 we have had a big push on getting old and new catalogues coded according to a standard manuscript cataloguing template and added to IDP. There are now twenty catalogues, all but one complete, on the web, with another five due to go online soon. These represent 34,805 detailed catalogue records. These can be viewed as a ‘catalogue’ — i.e. like reading a printed catalogue, but each entry is also linked to the relevant manuscript or item so that you can see several different authors’ research attached to a single manuscript. Click here to see catalogues. IDP is about to launch an educational and research section on its website. This web area has been created specifically for teachers and educators who wish to explore the culture, languages, religions and creativity of the Silk Road with their students. It contains special sites as well as information on workshops and other events. The research pages give details of the research interests of IDP staff and their publications and offers a space for relevant research papers by IDP and others. It will also give researchers free access to tools developed by IDP, such as those for the palaeographic project, to help their work. Full details will be given soon on the IDP home page. 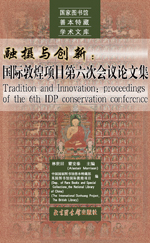 Following the Sixth IDP Conservation Conference in Beijing, the National Library of China is publishing a bilingual edition of the papers, edited by Lin Shitian and Alastair Morrison. The volume, out in May 2007, contains twenty-seven papers, all in both English and Chinese, along with a bilingual glossary of conservation terms and a bibliography. Copies are available via IDP (see publications). Work has continued in China on digitisation and inputting of data. IDP China completed the XML markup of the catalogue of paintings from the British Museum (Arts of Central Asia) and this will go live shortly, in English and Chinese. 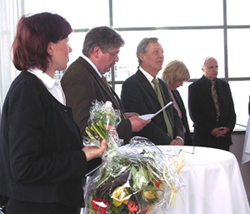 After the retirement of Prof. Dr. Peter Zieme, Dr. Desmond Durkin-Meisterernst has been appointed the new Head of the Akademienvorhaben Turfanforschung of the Berlin Brandenburg Academy of Sciences and Humanities. Thanks to additional financial support by the German Research Foundation and the Corpus Inscriptionum Iranicarum (London) the restoration and conservation of quite a great number of fragments of the Berlin Turfan collection was possible prior to digitisation. This work was carried out by the specialists in paper restoration from the conservation department of the Staatsbibliothek zu Berlin — Preußischer Kulturbesitz and Dirk Schönbohm (freelancer — conservator). See Turfan Conservation in Berlin for details of one conservation project. Data entry and digitisation has continued at IDP Japan with thousands of images and entries this year. Dr Imre Galambos will spend a year from June 2007 at IDP Japan, invited by Ryukoku University, to collaborate with institute members on their work, and to continue IDP’s palaeographical research. 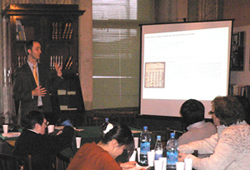 Alastair Morrison of IDP shown presenting the web resource on Tangut studies at the Ford Foundation Symposium in St. Petersburg. The Institute of Oriental Studies hosted the second Ford Foundation symposium (report in next issue) on Tangut studies. Work has continued on the Chinese scrolls and there are now over 6,000 images online. IDP and the Dunhuang Academy finalised their agreement and work will start shortly on digitisation of the manuscripts in the Academy. IDP is applying for funds to assist in this work. Kazushi IWAO, JSPS Postdoctoral Fellow for Research Abroad, arrived from Japan at the beginning of April 2007. He will spend two years with IDP carrying out research on the taxation and administrative system in the eighth and ninth centuries of the Old Tibetan Empire in Central Asia. He is also engaged in the study of the Tibetan Śatasāhasrikāprajñāpāramitā and Aparimitāyurnāmamahāyāna sutra in collaboration with Sam van Schaik. Susan Whitfield and Alastair Morrison of IDP gave papers at a conference hosted by The National Museum Institute, New Delhi, on Cultural Interactions on the Silk Road. They also held meetings with the National Museum about possible collaboration. Alastair Morrison, Sam van Schaik, Imre Galambos and Susan Whitfield visited St Petersburg in April for the Second Symposium in the Ford Foundation project (report in next issue), and for meetings with the Institute of Oriental Studies concerning ongoing collaboration. 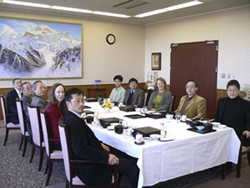 Susan Whitfield went on a lecture tour to Japan and the US, giving papers to the International Institute of Advanced Buddhology (IRIAB) at Soka University. Japan, at the Bowers Museum, LA, University of California at Santa Barbara and University of California at Berkeley. IDP is grateful to The Friends of the British Library for their generous grant of £5000 to complete the digitisation of the Tibetan Tantric manuscripts. 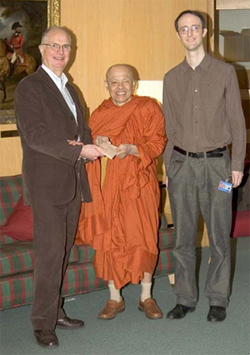 Venerable Phra Kru Samu Lom with Alastair Morrison from IDP (right) and Geoffrey Newman, OBE, (left) of the Friends of the British Library, who made the introduction. We are delighted that the ‘Sponsor a Sutra’ scheme continues to be a popular form of support for IDP. With over fifteen sponsored sutras in 2007 so far, we have been able to digitise more manuscripts and we are most grateful to all our sponsors. Many thanks are due to our many donors over the past few months. Whether large or small, they all help IDP’s valuable work. Most importantly, they enable IDP staff to concentrate on the core work of IDP: the less time we have to spend on fundraising, the more items we can digitise, research and publish. Special thanks are due to the Venerable Phra Kru Samu Lom (pictured right) from the Buddhapadipa Monastery for his generous donation towards the digitisation of Buddhist manuscripts.